If you are looking for a really unique iPod speaker this is it, the portable shopping bag-shaped iPod speaker. 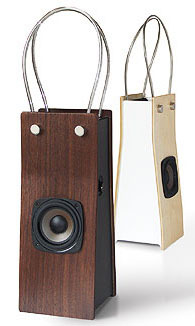 Designed by artist Yoshihiko Satoh for Marumiya Furniture, the speaker really does resemble a shopping tote bag. It has straps that you can use to hang it up on a hook in your room. It even functions like a shopping bag – to some extent- you can stash your iPod on top of the "shopping" bag where it’s hollowed out a bit. You can purchase this shopping bag-shaped iPod speaker at e-select for 31,500 Yen, or around $300.